Why should tenants be evicted because the landlord wants to sell? To be a landowner was to be endowed with economic, legal, social and economic power. On the basis that the primary responsibility of government was to defend the country, those who owned the country presumed to be best placed to monopolise the electoral franchise and undertake that task. During the 18th and 19th century, fortunes were made through the ownership of urban land in particular. As cities expanded, demand for land enriched those fortunate enough to hold the title deeds to the fields and meadows that were acquired to build the houses, factories and infrastructure necessary to support a modern urban economy. 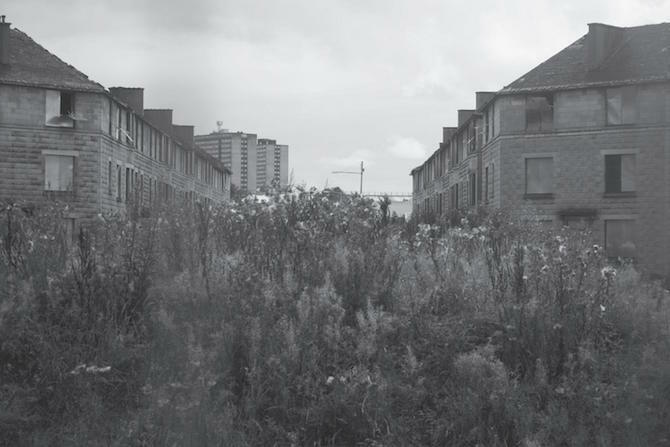 “An exclusion zone was imposed upon Edinburgh by the activities of the Heriot Trust’s acquisitions” wrote urban historian, Professor Richard Roger. “Scarcely an acre in the neighbourhood came into the market which they did not instantly acquire for the benefit in perpetuity of Heriot’s Hospital”. By the end of the 19th century, the Trust owned over 1700 acres of land around the City. Much of this comprised land between Edinburgh and Leith. 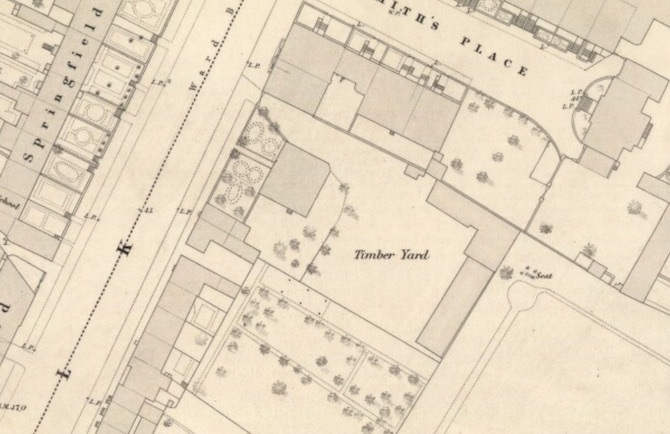 Samuel Hunter’s timber yard in Leith, 1852. Lorne Street was built along the south. One of those who held a feu from the Heriot Trust was Samuel Hunter, a stonemason and builder who owned a yard on Leith Walk at Smith Place. He ran a successful business as a property developer and builder and in 1879, was granted a further feu by the Heriot Trust to erect blocks of tenements at the western end of what is now Lorne Street. When he died in 1893, his daughter Agnes Hunter inherited a substantial property portfolio including her own elegant house on Dalrymple Crescent in the Grange. Upon her death in 1954, her executors established the Agnes Hunter Trust which continues to own over 90 tenement flats in Lorne Street occupied by over 200 residents. The Trust is a charity and provides grants to health and social welfare projects. The Trust established a reputation as a landlord that provided long-term secure tenancies. “We were promised a tenancy for life”, said one tenant. “Stay as long as you like”’, another was told. The Agnes Hunter tenants comprised a close-knit community of all ages. The oldest resident has lived there for 74 years, having moved in aged 2 years old. The younger children all attend Lorne Primary School adjacent to most of the tenement blocks. But whilst tenants felt secure, their homes suffered from poor maintenance. Damp persisted for years in flats, waste water rose through bath and kitchen pipes, window frames rotted and repairs were ignored. Many tenants undertook work themselves, installing bathroom sinks and even a heating system. Some tenants began leaving and others were evicted. In July 2015 all 200 of the Trust’s tenants were informed by letter that “retention of The Agnes Hunter Trust’s property portfolio was no longer in the interests of the Trust” and all households were to be evicted by the end of the year. A determined campaign by residents was launched and the Lorne Community Association secured a stay of execution until the end of January 2016. Following a petition to Edinburgh Council, this was extended to July 2016 in order to allow time to try and establish a housing co-operative or similar solution. To the wider world, evictions on this scale came as something of a shock. Few knew anything about the Agnes Hunter Trust. I had some vague recollections of my own from 7 years spent living in a flat on Lorne Street but I forgot all about it until the story appeared in the newspapers. At a time when the Scottish Parliament is, at long last, considering a Bill – the Private Sector (Tenancies) (Scotland) Bill – to modernise tenants rights and provide greater security of tenure, it is worth reflecting on what a shocking state of affairs these evictions represent. Most tenants are on Short assured tenancies. Despite the assurances of lifetime security, most tenants in law were never more than 2 months from eviction. The short-assured tenancy was introduced in the 1988 Housing Act. The idea was that these tenancies would provide a landlord-friendly tenure for the private sector, allowing it to grow at the same time as Housing Associations were given the freedom to access private finance. The result has been the growth of one of the most unregulated, liberal and (from a tenant’s perspective) insecure rental markets in Europe. Britain’s obsession with homeownership has led to eye-watering levels of private debt, house prices outstripping earnings, a speculative volume housebuilding industry that profits from land value appreciation and consumers spending growing proportions of their income on housing costs. Sometimes it takes a case like Lorne Street to focus minds on long-standing policy failures. The private rented sector has grown in a haphazard manner driven by buy-to-let landlords and little in the way of a strategic plan. A system where 200 tenants can be evicted on a whim reveals serious flaws in Scotland’s housing tenure. One of the most glaring question (which has, as yet, not been addressed) is quite simple. Why should 100 families have to be evicted merely because the landlord wishes to sell their homes? The short answer is, of course, because the law allows it. But this situation would never arise in, for example Germany. The fact that a pension fund might wish to sell its portfolio of flats in Hamburg to another investor does not mean that all the tenants have to be evicted. To the Germans such an idea would be ridiculous. Owning rental property is perfectly legitimate but if you sell it, tenants stay put in their homes. Tenants enjoy security of tenure and the landlord a regular return on their investment. In other words, we have no responsibility to families we have housed for over 60 years. They are merely an asset to generate a revenue stream – this from the Chair of a Scottish charity which, among other things, funds homelessness projects. Such attitudes are an indictment of 15 years of devolution. The Scottish Government’s Private Housing (Tenancies) (Scotland) Bill will have its final reading next Thursday 17 March. It introduces welcome changes to the private rented sector including a new tenancy that affords greater security for tenants. But, crucially, the wish to sell a tenanted property remains a lawful reason to evict a tenant. Whilst such a provision has a role in a transitional period, it will do nothing to contribute to the kind of long term security enjoyed by tenants in Germany. Whilst crofting tenants, agricultural tenants and commercial tenants are lawfully entitled to remain in occupation of their crofts, farms and offices when the property is sold, people whose tenancy is their home are rendered homeless on the arbitrary whim of the owner. It is an antiquated state of affairs that has no place in a modern democracy. The unstated, and unquestioned, view that underlies these provisions is that eviction and homelessness are appropriate management tools to address business failure or change. These provisions ensure that private landlords or lenders can remove tenants when thing go wrong with the business or they want to disinvest. And most importantly, the value of the asset is protected by ensuring that it is linked directly the property values in owner occupation. It also means they can borrow more to invest and make bigger returns on capital values. Equally importantly what they also do is transfer the cost (aside from the personal trauma and disruption to the tenant) on to the public sector. By protecting the value of private rented houses in this way and transferring the risk and costs of business failure on to the tenant and local authorities, landlord and investors can be confident that they can sell out relatively quickly and at very little cost to them. The Lorne Street tenants have been given until July 2016 to see whether they can devise a solution whereby they form a co-operative to take over ownership of perhaps persuade a housing association to step in. They deserve all the support we can provide. Meanwhile MSPs should question whether it is right that folk who have lived in their homes for decades deserve to be treated as little more than collateral damage in pursuit of the owner’s short term interests. In particular, they should examine critically Schedule 3, Part 1 1(1) of the Private Housing (Tenancies) (Scotland) Bill – namely, “It is an eviction ground that the landlord intends to sell the let property”. If tenants are to feel secure in their homes, this provision should be removed. Patrick Harvie MSP has tabled an amendment to remove this ground for eviction. Scotland needs investment in a sustainable, high-quality, affordable rented sector. It needs to learn from successful countries such as Sweden and Germany. Above all, it needs to ensure that never again is a community treated with the contempt and arrogance faced by the families of Lorne Street. This blog is reproduced with permission from the University of Glasgow’s Policy Scotland blog. In May 2014, the Land Reform Review Group submitted its final report to the ScottishGovernment. The First Minister announced in November 2014 that the Government would consequently bring forward a Land Reform Bill, which was published in June 2015 and is currently under consideration by the Scottish Parliament. The Land Reform Bill concentrates mainly, but not exclusively, on rural aspects of land reform. Alongside this, the Scottish Government is currently undertaking a consultation programme on the recommendations made by the LRRG for urban land reform. These have potential fundamentally to change the operation of urban land markets in Scotland. If adopted, they could have significant impact on planning, housebuilding and real estate development across Scotland. 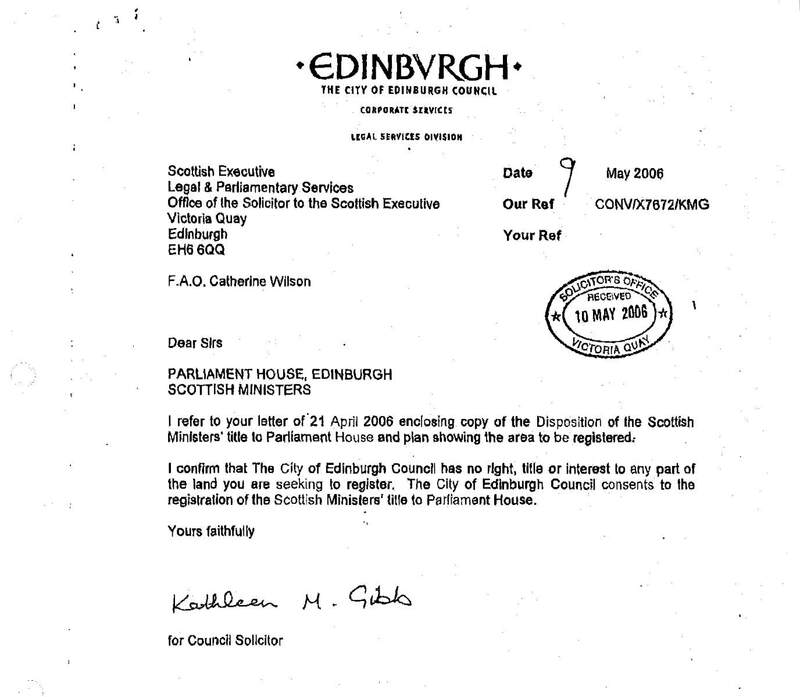 This blog is long overdue (as indeed are many) but I understand that the City of Edinburgh Council’s Audit Committee will shortly be considering a report into the Parliament House fiasco. It is therefore appropriate to publish this second update on the affair. The original story is here and Update 1 is here). In summary, Parliament Hall forms part of the common good of the City of Edinburgh but, through a series of apparent blunders, title was granted to Scottish Ministers in 2005 (see the original story for full background). In 2010, Fergus Ewing, Minister for Business, Energy and Tourism signed the Transfer of Property etc. (Scottish Court Service) Order which vests the property in the hands of the Scottish Courts Service. On 19 February 2015, four days after the story broke, Alison Johnstone MSP asked the First Minister whether the Scottish Government would co-operate in resolving the matter (see above video clip and Official report pg 16 here). Alison Johnstone then wrote to the Scottish Government and received a reply. At the same time a Freedom of Information request revealed other elements of the story. These are outlined in what follows. On 9 March, Cabinet Secretary Alex Neil wrote to Alison Johnstone and outlined how, in the view of the Scottish Ministers, Parliament House (or Parliament Hall as it is called in the letter) came to be regarded as being in their ownership. It appears that Scottish Ministers are relying on the Commissioners of Works Act 1852 which, in Section 4, vested all the courts and buildings of the Courts of Session and Justiciary in the ownership of the Commissioners of Works. Since Scottish Ministers are the statutory successors to the Commissioners, the argument goes, so Scottish Ministers were entitled to seek to obtain a Land Register title from the Keeper of the Registers of Scotland. I do not find this a credible explanation. Acts of this sort are passed by Parliament to transfer the ownership of property from one public body to another. The 2010 Order mentioned above is a contemporary example of such legislation. Such Acts cannot lawfully transfer land or property owned by third parties (which includes land owned by local authorities such as the Royal Burgh and Corporation of Edinburgh. As noted in the original blog, Parliament House is a building about which much is known. The City accounts of 1875-76 place on record the Council’s ownership of the building. A comprehensive report of 1895 on the Municipal Buildings of the City does the same. And the comprehensive asset survey by the Town Clerk and City Chamberlain in 1905 (Report of the Common Good of the City of Edinburgh by Hunter & Paton) re-iterates the Council’s ownership. It is inconceivable that theses officers of the Corporation could be recording the ownership of this building in 1875, 1905 and 1925 if, as argued by Scottish Ministers today, ownership of the property had been transferred by an Act of Parliament in 1852. Had the 1852 Act transferred ownership, the Council would know all about it. But the Act did not do this because such Acts cannot ( in the absence of a court order or other legal means of acquisition) transfer the ownership of property that is not already in the ownership of a public body accountable to Parliament. In information released as part of a Freedom of Information request to Scottish Ministers (6,2Mb pdf here), it is evident that the Council had made contact with Scottish Ministers as far back as February 2014. Further internal correspondence relates to media enquiries made in February 2015 by Gina Davidson from the Evening News who worked on the story with me. The Council appears to have made contact with Scottish Ministers as far back as 6 June 2014 in a letter outlining its concerns (see here). Finally, I have obtained a fax from the Faculty of Advocates dated 19 June 1997 that claims that the Laigh Hall (which used to store the Maiden, the gallows and the City lamps) had come into the ownership of the Faculty from the Town in exchange for properties to the north of the Signet Library. There is no evidence that this claim has any foundation in fact. Whether the City of Edinburgh Council will be able to recover ownership of Parliament Hall is yet to be determined. The most interesting revelation from the above is the assertion by Scottish Ministers that the 1852 Act was the basis upon which they proceeded to assert their title. I think this view is flawed. 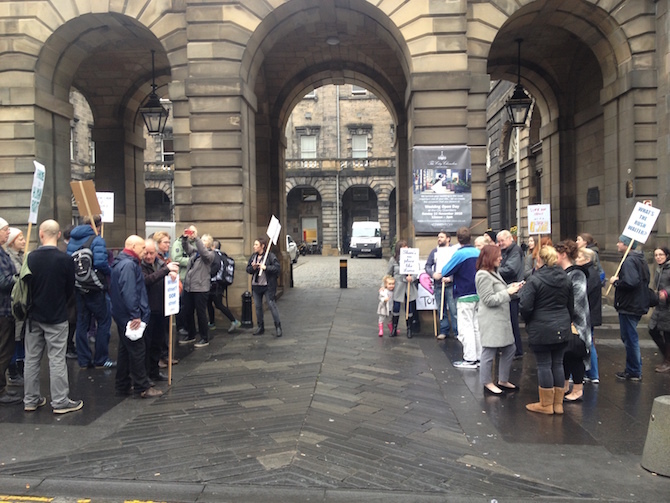 The City of Edinburgh Council’s Audit Committee meets on 18 June.